The technological world of professional audiovisual solutions also offers innumerable advantages to the educational and institutional sector. Write on a whiteboard about PDF files, share screen wirelessly with tablets and endless possibilities. 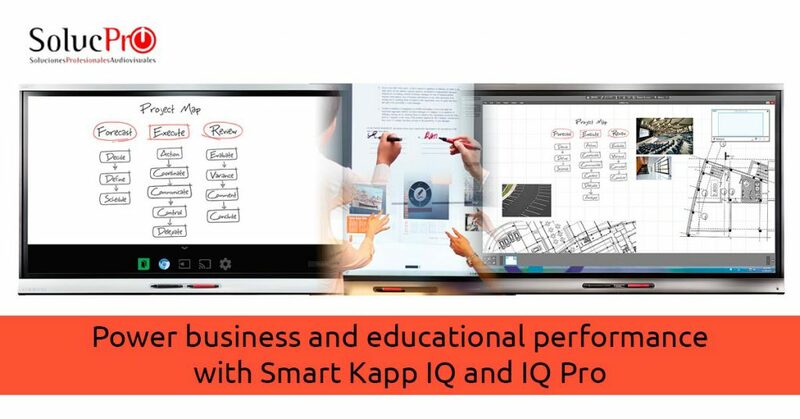 These benefits and many more can be obtained thanks to the technology of Smart Kapp IQ and IQ Pro. There are interactive products of the Smart brand that promote both better educational learning and greater business and institutional performance. Discover everything you can get. To write about a PDF file brainstorming on the board while it is broadcast by videoconference. This is just one example of what Smart Kapp IQ and IQ Pro achieve for you thanks to the fact that interactivity with the environment it is maximum, and its wireless connectivity through the app makes it possible for all users to be connected. With a quick and sensitive response to the slightest touch, these interactive products allow simultaneous writing with two different colours on any document. In addition, its maximum usability: the fingers to select, the markers to write and the palm of the hand to erase. Share the content with any chosen device, on any screen or taking advantage of Ultra HD, always protecting confidential work. Control the screen entirely with your hands, from writing to swiping. Organize the notes of the devices and save or export them as PDF or an image. Integrated web browser to share screen via wifi with other devices. Smart technology is able to offer a world of possibilities through these devices. These interactive screens are exceptional because they give an image of modernization, but mainly because they help to boost business and educational performance. Regardless of the sector in question, its attractive technological options make Smart IQ and IQ Pro an innovative, impactful and solvent choice, without losing a bit of functionality. It is a perfect tool if you are looking for technology for corporate communication. Get impressed attendees, create polls, voting in real time and share their own presentation on their devices to the point where they can interact. Do you need to present your workers with the new projects? Surely only the fact that they can follow it on their tablets makes them pay more attention. You can even send it later in PDF so that everyone can have it without having to take notes. Thanks to this way, you will gain attention during the presentation. If you are looking for educational technological equipment, it is also your product. Ideal for those who intend to make different presentations or classes in which students are more involved. Do you want the students to participate? Have them come out in pairs and write with the custom marker each on the board. They will have fun experimenting their operation, at the same time that you will be able to encourage their participation. In addition, in the society in which we live today, students will feel more familiar with tablets and technology than with the classic paper and pen. As you can see, SolucPro also offers the best audiovisual solutions for the education and business sector. It manages to promote the participation and interest of your audience, regardless of who they are, and thus gain attention and productivity. With Smart IQ and IQ Pro you will be able to raise your technology one step at a time, while your objectives will be fulfilled in terms of capturing your audience.